It’s time to get clued in on the Canary Islands! Heading to these shores opens the door to spectacular natural beauty, year-round sun and some truly unique sights. 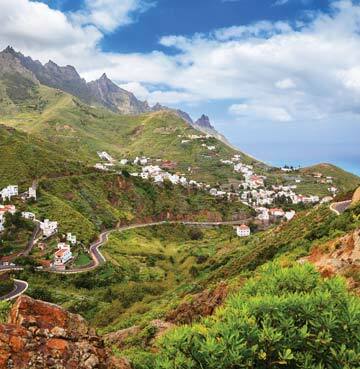 With so much to see and do, there’s a Canary Islands villa holiday for all tastes. If you love days at the beach then take your pick between golden shores and dark volcanic sands. Maybe the great outdoors sounds a little more tempting? Welcome to trekking paradise! Hike across mountains, tropical forests and volcanic terrain for your back to nature adventure. This is just the beginning of the Canaries amazing appeal, there’s plenty more on these shores. So dive into our Canary Islands holiday guide and learn all about this incredible destination. When it comes to the battle for the Canary Islands’ best beaches, Gran Canaria really gives Fuerteventura a run for its money. There’s sand dunes on these shores too! And the Maspalomas Beach sits right on the edge of this wonderful nature reserve. Strolling through the walking routes that dissect the dunes, you’ll really appreciate the beauty of the Gran Canarian coastline. The island also goes toe to toe with Tenerife in the battle to be king of the coast. Towering cliffs characterise Tenerife’s beaches, but Gran Canaria has its own coves tucked away among the rocks. The tranquil Playa Taurito is perfect for taking in the mountain scenery. For seaside charm, be sure to head to Playa de Mogán. Stretch your legs with a stroll along the harbour or around the village, taking in the traditional buildings as you go. The beach here is tailor-made for families, with soft golden sand and calm waters. Your little ones can splash to their heart’s content. In fact you’ll find plenty of fascinating old towns on Gran Canaria. The pick of the bunch may well be in the capital city of Las Palmas! Vegeuta is the oldest part of town and its narrow streets are just brimming with historic charm. Even down to the detail of doorways and decoration surrounding windows. The Cathedral de Santa Ana stands proud in the square of the same name and with two impressive towers, it’s the icing on Las Palmas’ cultural cake. Last but not least it’s the lava plug that keeps watch over the rest of Gran Canaria. Roque Nublo sits up in the clouds and stands at an enormous 80m! Impressive from afar, it’s even more mesmerising up close and personal – so be sure to take the trek to the top. But be warned, you may be blown away by the panoramas! The rural park here is a blend of pine trees, plant life and picturesque villages. If the thought of exploring lava fields has you bubbling beneath the surface, prepare to erupt with excitement at the Timanfaya National Park. This is your ticket to trekking across volcanic terrain! From towering red rock, to deep craters – the landscape here is out of this world. Your volcanic voyage of discovery continues at the Cueva de los Verdes. A lava tube that lights up visits for plenty of Lanzarote’s intrepid explorers. Once used as a hideout for locals taking refuge from invading pirates, you’ll feel like you’ve stumbled upon buried treasure in this underground gem. Marvel at the rock formations as you stroll through the maze-like tunnels. Be sure to visit the stunning lake that calls the caves home too. Enjoy the natural beauty of Lanzarote from a different perspective at the Mirador del Rio viewpoint. Not for the feint-hearted, this is one for those with a head for heights. Almost 500m above sea level, the scenery here is breathtaking. 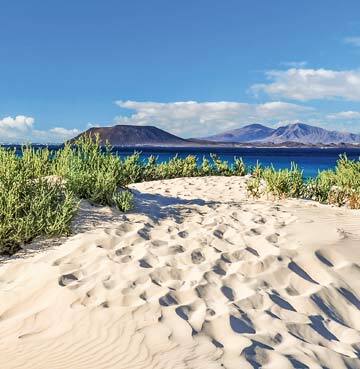 Looking over the sparkling sea, across to the island of La Graciosa – you could spend hours here without even realising. Although staring out over the golden sand might have you itching to get to the beach. And as you’d expect from the Canary Islands, there’s a choice between light and dark sands. 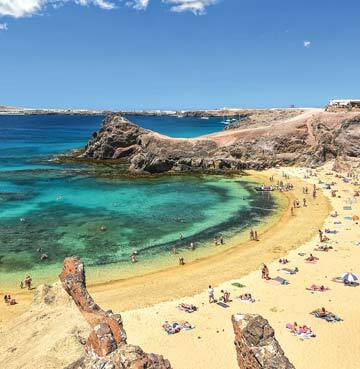 Papagayo Beach is a charming bay of golden sand, which you’ll find as inviting as it is idyllic. The towering cliffs shelter this cove from winds, offering perfect conditions for soaking up the sun. When it comes to beaches of black sand, it doesn’t get any better than El Golfo’s Charco de los Clicos. A captivating blend of red rocks, black sand and a marvellous green lagoon. Fuerteventura feels like heaven for beach lovers. There’s golden sands galore on this amazing island, with over 150km of beaches to choose from. So it’s easy to argue that Fuerteventura takes the Canary Island crown when it comes to spectacular beaches. And that’s before any mention of the watersports and adventures at sea! The conditions here are perfect for all kinds of surfing, from kite to wind and just jumping on your board to catch a few waves. The strong winds make trying your hand at these a real gem on Fuerteventura’s shores. Snorkelling and diving are a delight too, with crystal-clear seas and warm waters. Corralejo Beach is one of Fuerteventura’s finest. A long stretch of golden sand, shimmering in the year-round sun as it meets the turquoise waves. This the type of picture-perfect scenery that you’d expect to find on postcards! The beach also borders the dunes of Corralejo’s national park. Stretch your legs as you trek across this stunning desert-like part of the Canary Islands – getting back to nature has never felt so good. Head inland and you’ll find just as much charm and beauty. It doesn’t get much better than Betancuria! This is Fuerteventura off the beaten track, far from the clutches of tourism and brimming with tradition. Tucked away in a beautiful green valley, mountains and hills create spectacular views around every turn. Be sure to take a winding wander around the cobbled streets too! Ancient buildings are dotted throughout Betancuria, including the mesmerising church of Santa Maria, a handful of fascinating museums and lots more. Families will find plenty of fun on Fuerteventura too – making it ideal for visits with your little ones. Why not swap the sand dunes for slides in Corralejo? The Acua Water Park is the perfect spot to splash around, race your kids on slides and find thrills on the 100m slide! While the Big Jacuzzi and Slow River offer a welcome break from the action. If your children are budding animal experts, add La Lajita Oasis Adventure Park to your Fuerteventura itinerary. Animal encounters await for your little wildlife lovers. Whether their favourite critters live on land, call the sea home or soar overhead – they’ll be spoilt for choice. Grab a seat for one of the live shows and learn some fascinating facts about these amazing animals. 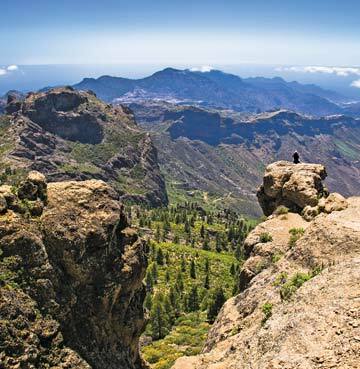 Take in Tenerife from the top of Mount Teide. If you’re searching for somewhere to enjoy the volcanic landscape, you’ll struggle to find a better spot! Plus, on a clear day you might catch a glimpse of Gran Canaria and the smaller Canary Islands of La Gomera, El Hierro and La Palma in the distance. Tired legs can take the cable car to the top in just eight minutes! While trekking fanatics will love the five hour ascent, marvelling at craters and rock formations as you go. Head north and swap the rocky terrain for the greenery of the Anaga Country Park. Home to tropical forests and beautiful native flora, the volcanic terrain of Teide will feel a million miles away. The Laurisilva trees are a highlight! You’ll only find these in a handful of other European countries. If plant life is a holiday must-see, be sure to head to Icod de los Vinos. An incredible 800 year-old dragon tree draws visitors in their droves. Although an amble through the cobbled streets is just as fascinating. You’ll get a flavour for traditional Tenerife here, dotted with 16th and 17th century chapels and a charming town square. Maybe lava tunnels are a little more alluring than the leaves and branches? Nearby you’ll find Europe’s longest lava tube in the Cueva del Viento. In fact, you’d have to head to Hawaii to find any longer than the Canary Islands’ ‘Cave of the Wind’. Exploring the caverns and tunnels will leave you feeling like a true underground adventurer. All this talk of Teide’s summit and cable cars might have left you feeling a little uneasy, but there’s plenty of ways to enjoy Tenerife’s landscape at a lower altitude. Why not take in the towering cliffs from below as you top up your tan? The mountainous coastline is the backdrop to amazing beach days, on the dark sand of Los Gigantes Beach. Be sure to step foot on a black sand beach and tick this off your Tenerife to-do list! If you’ve never set eyes on one before, save this sight for a trip to El Bollullo Beach. This charming bay is home to rich volcanic sand, views of craggy cliffs and an air of tranquillity. It wouldn’t be fair if we touched upon Tenerife’s shores without mentioning the stretches of golden sand too. Los Cristianos oozes seaside charm and a relaxing vibe, while Playa de Las Teresitas offers plenty of space and even more of those mountain panoramas. Fallen for Fuerteventura? In love with Lanzarote? How about Tenerife or Gran Canaria? Whichever island has sparked your holiday excitement, it’s time to pick a villa that gives you an even greater buzz. Our villas in the Canary Islands are your home away from home - so you’re all taken care of. Whether you’re planning on exploring the islands from end to end or spending lazy days beside your private pool. Planning your next getaway starts right here.